At a first glance little seems to have changed from the car that last year drove through the worst Le Mans weather in living memory to claim third place overall. In fact every component has been analysed and then retained, revised or replaced as required. By the end of this process little more than half of the original components were retained for the 2002 design. 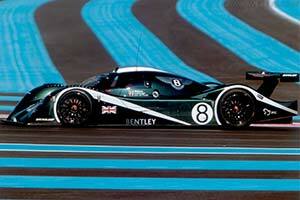 As in 2001, the EXP Speed 8 will be the only car in the LM GTP category for closed prototypes. The regulations differ principally from those that apply to the more commonly contested open prototype class by allowing a 1mm larger engine restrictor, but mandating two inch narrower tyres. The brief handed down to Team Bentley's designers for the 2002 car was to create a car, which retained the outstanding construction quality and reliability of its forebear, but to improve its already considerable dynamic abilities in every area. This meant more accessible performance, greater mechanical and aerodynamic grip, a more favourable downforce to drag ratio and better fuel consumption. Currently the car is on target to deliver every one of these critical considerations. Again the Bentley EXP Speed 8 managed to finish the race and secure the top spot in its class, overal it finished fourth behind the three winning Audis.